NuvusGro (NVGO) provides advanced Controlled Environment Agriculture Systems, with sophisticated automation and analytical tools designed to enhance productivity, energy efficiency and profitability. In order to meet and exceed the varied and complex requirements for growing medicinal marijuana, you need the right tools and support system to grow medical grade cannabis. NuvusGro's product and services are designed with growers in mind to fit their unique requirements regardless of the growing stage or production level. 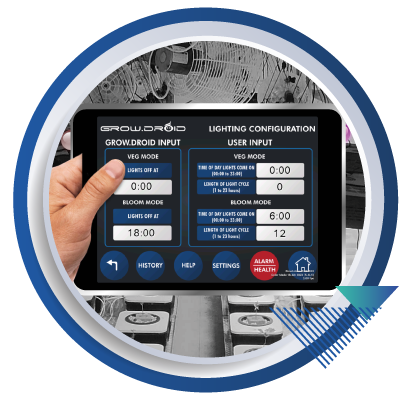 NuvusGro designed grow.droid™ product line - a specially engineered and integrated indoor grow system; with a software platform that maintains set profiles and conditions for optimal growth and cycle performance. 1 grow.droid™ is a self-contained and fully insulated premium grow system. This will allow for better growing functionality, security and protection from environmental pollutants while maintaining product consistency and quality. 2 grow.droid™ can be scaled based on growing needs and the size of the grow area. 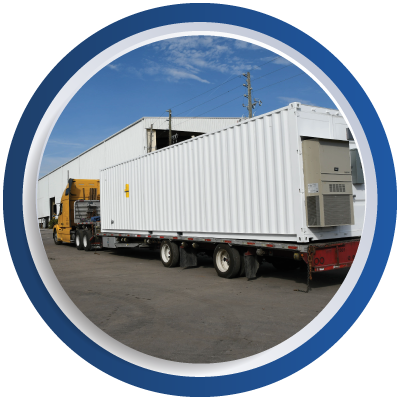 Scalable premium built insulated shipping containers or modular pre-fabricated facilities are available. Why build a building when you can start growing in 8 to 10 weeks? A full line of automated grow facilities from single standalone grow containers to large multi-featured pre-fabricated modules are available. Choose the design that best fits your needs! - An all-inclusive, premium, 52' prefabricated, modular grow facility. - Customize your build with specialty units from maintaining mother plants and cloning, to laboratory units and full office amenities. - Grow modules are designed with an earthen based modified EBB and FLOW grow system capable of growing up to 1512 plants. All water hydroponics grow system available as an option with a lower plant count. 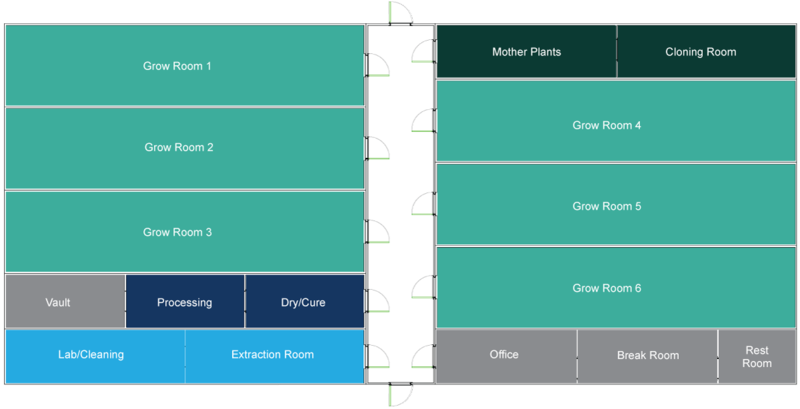 - The 11 module factory comes equipped with a custom center clean room and control area, 6 - 12 foot wide veg/flower grow modules and any combination of ancillary units such as: mother/clone, dry/cure storage, lab/process and office/break units. 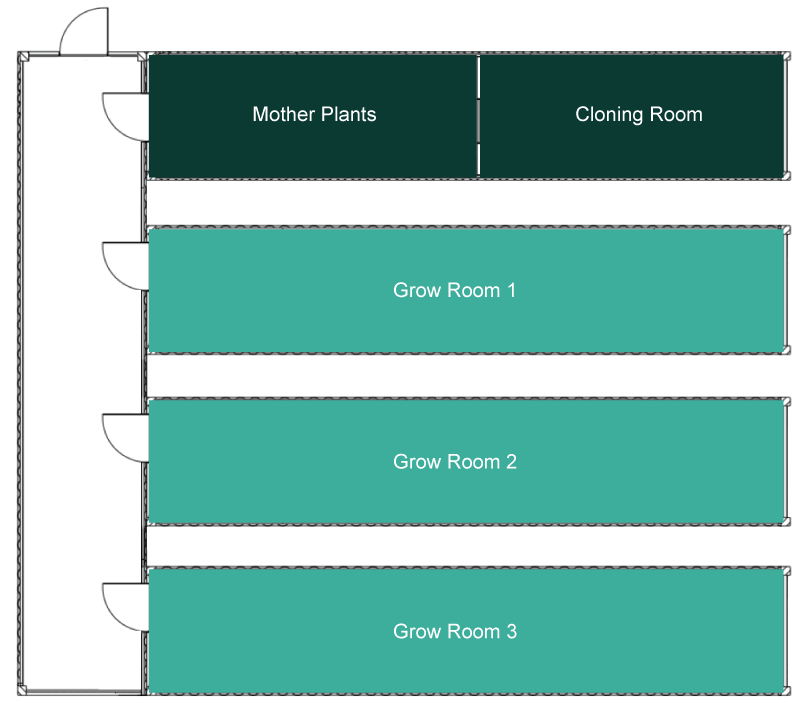 - Modular grow facility based on 40' high cube shipping containers. - Featuring a custom interlocking design, modules can be mixed and matched to meet the customers’ requirements. - Each system comes with a minimum of 4 veg/flower grow units and a custom center clean room/control room. - The modular facility can accommodate up to 8 specially designed containers and can grow up to 848 plants (if all units are grow units). - Customized options are available upon request. Contact us for pricing and technical specs. Pricing may vary based on growing method and location. - This 4 unit system contains a common clean room/control room designed to interconnect 4 modules on one side and takes up half the space of the full Enterprise design. It comes equipped with 2 veg/flower units. 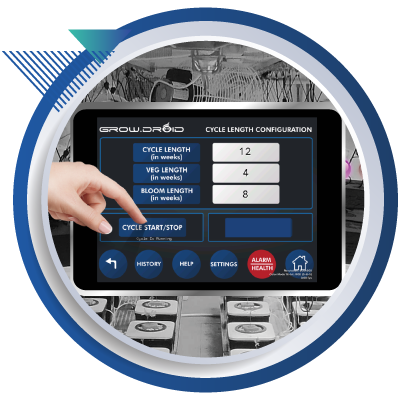 - As with its larger brother, the Enterprise Lite can mix and match units and these units can be purchased at a later date to fill out the facility. The Enterprise Lite uses the same container based units as the full Enterprise facility. - Stand-alone grow facility based on 40' high cube shipping container. - Excusive clean and control room protects the grow area. - All-water hydroponic or earthen-based grow system options available to grow 48 - 72 plants. Customized options are available upon request. Contact us for pricing and technical specs. Pricing may vary based on growing method and location. 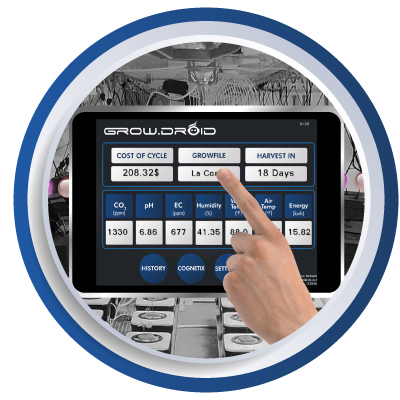 All grow.droid™ products are equipped with a version of our grow.droidTM Control System and CognetiXTM analytics platform software to automate and analyze plant growth cycles and aggregate operational data for daily, weekly, monthly and cycle reporting. CognetiXTM is tailored for each size from the single stand-alone grow.droidTM II to the Enterprise Factory. *Base features vary though each product and some features may be optional in some sizes. Complete climate control, ambient and water temperatures, lighting, CO2, pH and EC. 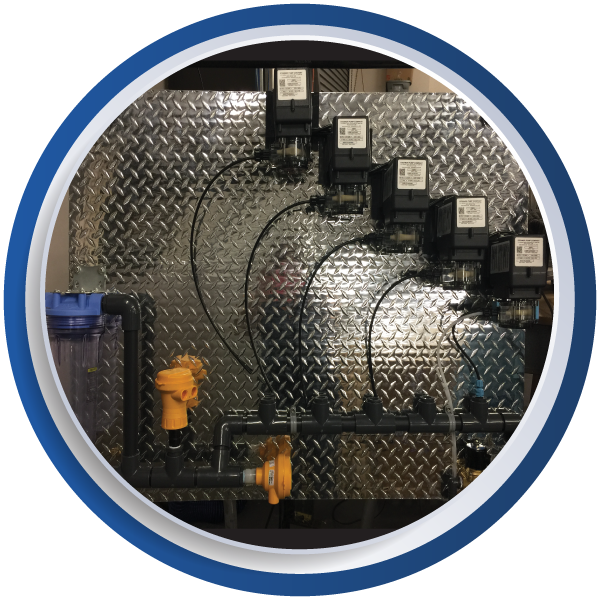 grow.droid™ CognetiX™ based control panel includes exclusive energy, water, and gas usage analytics and system fault detection. Cycle information indicating time frame of the grow cycle. System overview of all current sensor readings, resource monitoring and power consumption. Indicates the set points for the cost of power, water and nutrients for current cycle. Customize recipes for pH, EC, CO2, water and air temp, and humidity. Customize cycle length with independent control for bloom and veg cycle. Set a specific automatic lighting schedule. User management includes password protected login for changes and updates as well as e-mail alarms and notifications. Review and analyze power usage of current and historical cycles. Monitors all the equipment and detects possible failures. Catches problematic equipment before it fails. Monitors and detects changing power usage. Shows levels of gases and liquids used. Detects the amount of used nutrients and indicates the level of remaining nutrients. Detects the time between dosing events. Master override to enable complete manual control of all systems. Manual override for all subsystems - i.e. HVAC, CO2, dosing. Temperature, water levels, pH balance, humidity, nutrient level, CO2 level, power usage, nutrient dosing, acid/base (pH) stabilization, CO2 injections, pressure sensors, etc. High definition PTZ cameras that allows surveillance from any smart device. Facility access is controlled from a mobile device 90 days NVR. A ferti.droid system can easily be added into any existing grow facility, with little or no interruption of the daily grow activities, and will instantly increase productivity and yields by eliminating one of the more costly and labor intensive daily tasks. This industrial computer brain contains the Artificial intelligence to monitor and control the fertigation process, doing all the thinking for the grower. The program recipe controls nine separate dosing injectors in the two process stages and can be programmed from a simple fertilization schedule to complex mixing that can change at specific intervals throughout the grow cycle. By utilizing powerful data analytics to access hundreds of data points, the ferti.droid helps the grower fine tune the fertigation system to ensure that every plant gets what it needs and that nothing is wasted. 1 The first stage prepares the raw water for processing. 2 The second stage adds the necessary nutrient as per the dosing recipe. 3 The third stage interfaces and controls the irrigation. 4 An optional fourth stage can recover a majority of the irrigation run-off and reprocess the water, thus greatly reducing demand for water. Brain power is what really separates the ferti.droid from any other fertigation system. 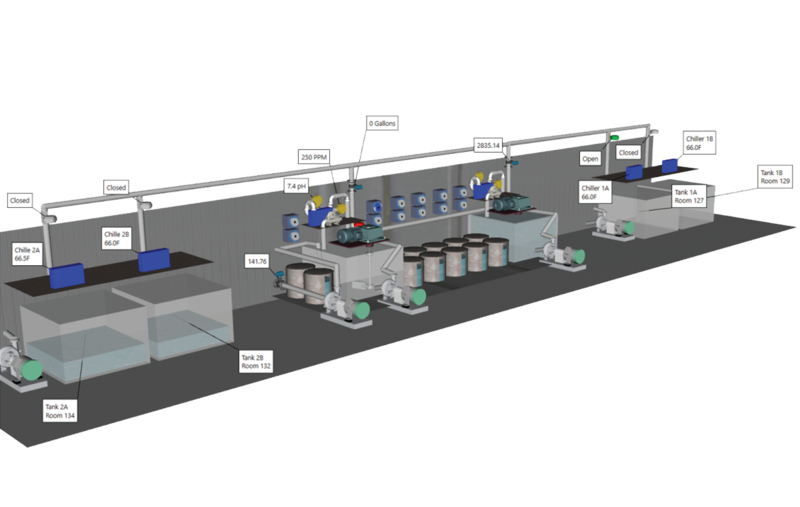 This multi-stage system is built with industrial process control sensors and dosing pumps in both the first and second process stages. The “brain” of the system is an industrial PLC (Programmable Logic Controller) with an intelligent human to machine interface (HMI) screen. The ferti.driod communicates by sending email or text messages about actions and events and can be remotely controlled by any mobile device.  Nuvus Corporation provides strong leadership and guidance to a collection of companies addressing the cannabis, hemp and mainstream agricultural industry. Nuvus keeps tremendous focus on the extraordinary opportunities in this ever-expanding industry. The standalone containers, grow.droid™ II, can grow up to 72 plants. The grow.droid™ Enterprise models can grow from 216 to 1512 plants. Do you have solar or other green lighting options? All our products come standard with State of the Art, high efficient LED grow lighting systems. Solar panels and alternative power sources are available upon request. How long do you guarantee the products? 1 year full warranty and low price extended warranties available for up to 5 years on most products. Installation is included in the price of the unit or system, although shipping is not. 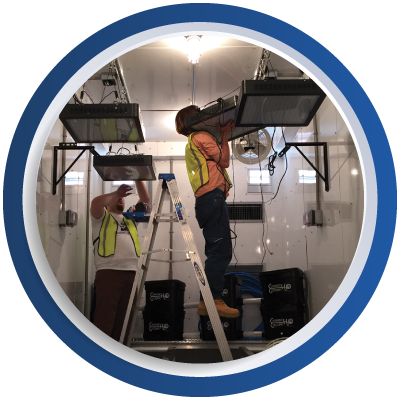 Typically installation, setup and training can take from 1 week to several weeks depending on the configuration and the project. Check with a sales consultant in your area for detailed information on specific products and services. When growing Cannabis, the return on investment can be as little as six months. Many factors can effect this and usually it take 2 to 3 grow cycles to “dial-in” the operations and obtain maximum yields. Our units come with a year of technical support. After the warranty period, there is a nominal annualy fee for tactical support and extended warranties. All grow.droid™ products can be remote monitored and have active fault detection. What if I only need some of the equipment or technology? We can work with you to determine the best solution to fit your needs. Can I upgrade to a larger space later? Yes, absolutely. Technology is scaleable and can grow with you! Is grow.droid™ software on a peer to peer where by one client computer acts as a server or does your software need a standalone server or is the information data "cloud based" or is the droid system simply hard drive driven on each machine. I did notice one system was cloud based. 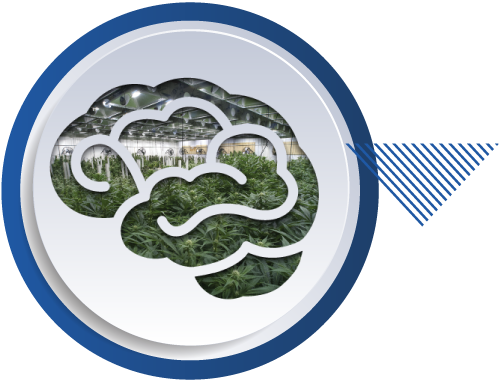 The CognetiX software is embedded into the grow.droid™ product line. The smaller systems utilize embedded software and cloud based systems. The larger system such as the Enterprise Factory have local processing platforms as well as cloud based services. What made you decide to go with 1600w LED lights? We utilize the newest technology in LED lighting which provides computer control intensity and light frequency. LED lighting is part of the standard for Controlled Environment Agriculture and is 40% more efficient than alternatives. LED lighting produces significantly less heat which reduces energy cost even more. Many recent studies have confirmed that these new generation LED fixtures can produce better results than previous lighting systems. Are the LED lights capable of being ratcheted up and down or are they fixed? Yes, each light unit comes with a ratcheting hanging system which can adjust the height of the lights by approximately 2 feet. What is meant by "Industrial Controls"? 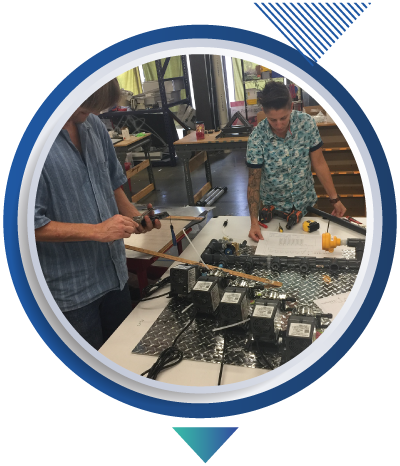 All grow.droid™ products are controlled and managed by industrial quality PLC based controls and sensors borrowed from other industries such as water treatment. The systems are custom designed and programmed to provide high accuracy and long life. We do not use hobby or kit type components. Does the grow.droid™ have air condition and dehumidifies? All grow.droid™ products are equipped with fully integrated air conditioning and humidity control systems. The environment is continually monitored by environmental sensors which tells the control system to turn on or off units such as humidifiers, de-humidifiers and Air conditioners. We do not just set a thermostat.